What is needed for proper drainage? 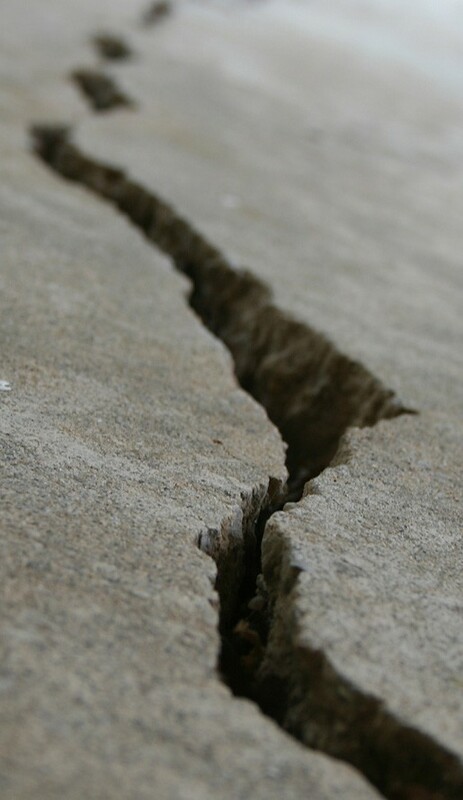 The land should slope downward away from the foundation to assure that water does not collect near or under the slab, and also to prevent a soil robbing streaming effect. The slope should be noticeable, in the range of 1 inch per foot for the first 8 feet from the foundation. A depression within the first 6-12 inches away from the house, caused by rain falloff from the roof line can cause water accumulation. There should be no ponding or accumulation of water either along the perimeter or within 20 feet of the house. Plant borders may contribute to localized pockets of moisture accumulation. The borders act as a natural water reservoir, and occasionally sprinkler systems are run more often in the planted areas than grassy sections of the lawn. Water from A/C units should be directed at least 3 feet away from the house. During our notorious Texas flash rains a massive amount of water is accumulated in rain gutters and directed to downspouts. Gutter downspouts concentrate the rain’s effect, and should be positioned to direct rainwater at least 3 to 4 feet away from the house. Repairs may include grading to alter the drainage slope, adding surface drains, or adding French drains. Sometimes French drains and surface drains are confused. Surface drains remove water at the surface, while French drains collect and drain away sub surface water. 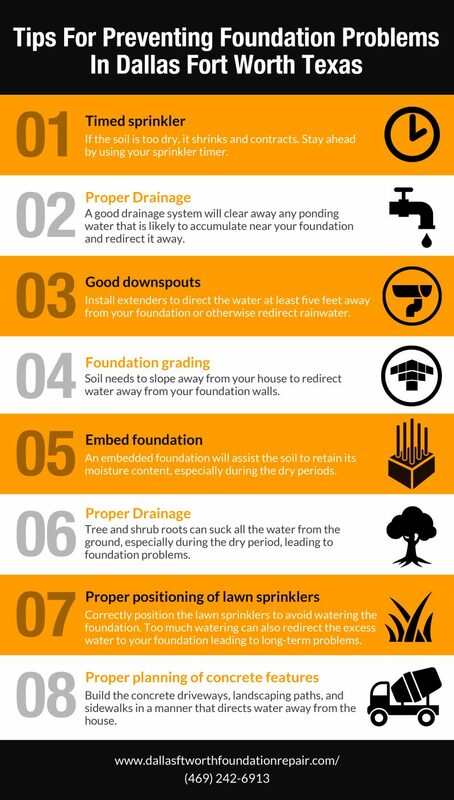 Sub surface water is often the culprit as it causes soil in the first 3-5 feet to expand, directly driving upward the beams which provide structural integrity to the house. A French drain may include surface drains, but also includes a buried perforated pipe that collects sub-surface water. Typically the mesh covered pipe is covered with gravel enclosed in another layer of mesh. 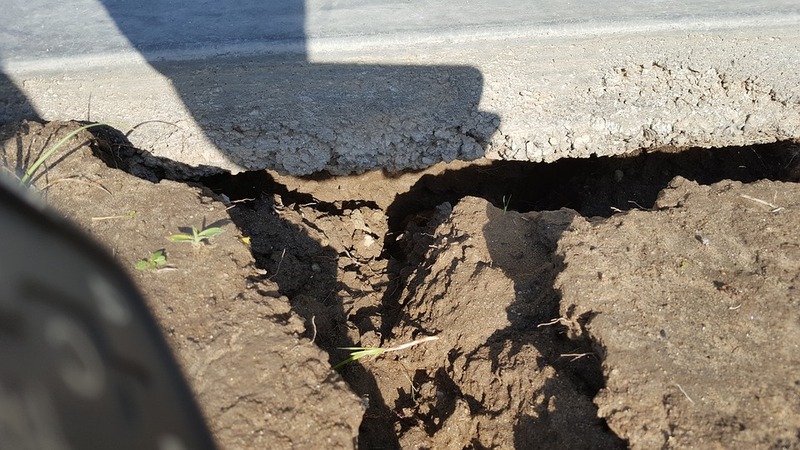 The gravel layer extends up to 6-9 inches below the surface of the soil. The drain is buried around three feet away from the slab, to a depth of at least the bottom of the perimeter foundation beam. Distance to the house should never be less than the excavation depth of the drainage system. Excess water either flows off through the drain pipe, or is accumulated in a reservoir and pumped away by an automatic sump. 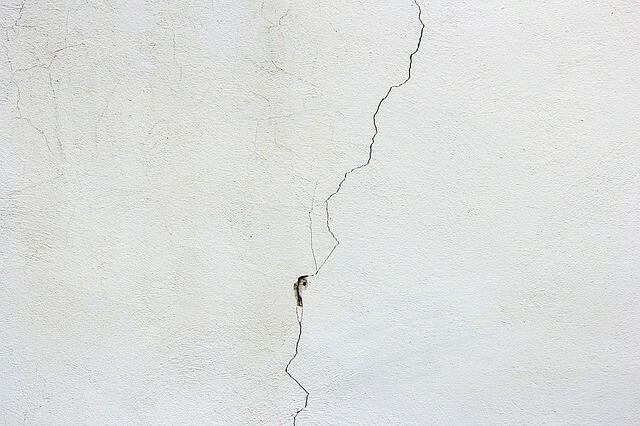 All of the factors that we have discussed play a role and are important to enable you to safeguard against the need for foundation repairs.